I snagged this recipe from the Saveur Magazine's web site. I started this liqueur last night so I'll let you know in 44 days how it turns out. I was tempted to try vanilla flavored beans but decided the first batch should be according to the recipe. I need something with which to compare my experiments. 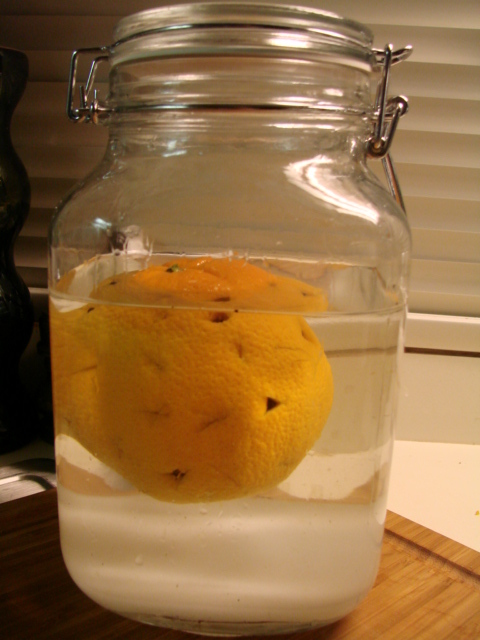 Stud the orange with the coffee beans, put in the jar with the sugar and rum and it's ready to hide for 44 days. Poke 44 1-inch slits all over the orange with a paring knife; stuff a coffee bean into each slit. 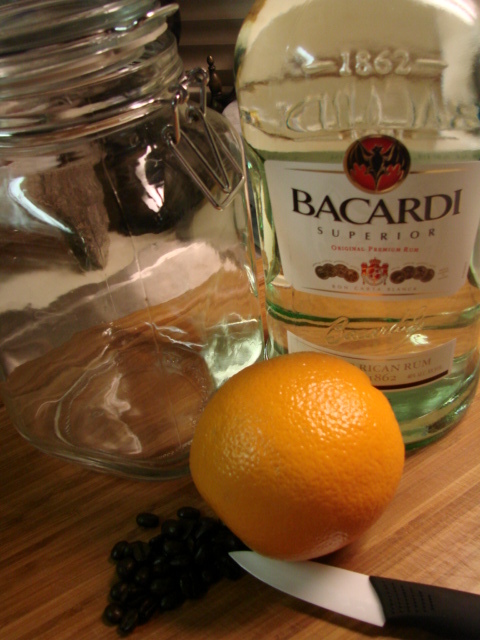 Put the orange along with the sugar and rum into a wide mouth jar with a tight-sealing lid. Store and let steep in a cool, dark spot, swirling the jar occasionally, for 44 days. Remove and discard the orange and strain the liqueur through a cheesecloth-lined strainer. Transfer to a clean bottle and store in the freezer until ready to drink. Serve neat or over ice. Can't hardly wait to taste it. Now I'll have to invent a drink using this.